It’s wonderful to see new eBook research looking at Australian children’s reading habits, especially in our growing digital age. New research out of Murdoch and Edith Cowan Universities in Western Australia has been released in a report published in Computers & Education, Volume 109, June 2017, Pages 187–196. 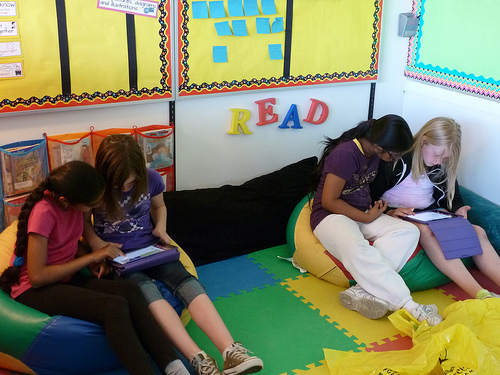 This latest report sheds more light on eBook reading trends for primary school aged children. It adds support to earlier findings from studies we discussed on The Literate Child Podcast in January. One factor to consider in this particular study is that it did not distinguish between eReader devices solely used for reading and Tablet devices which have other features such as internet, games, video, etc. Nor does it take into account non-book reading activities that may take place on a tablet but would not be considered a “reading” activity to a child. So, while the mean averages of reading frequency seem to decrease between children who have access to devices and those that do not, ultimately that average is flawed because of the lack of distinction between eReader and Tablet; and the lack of consideration of non-book reading activities that can take place on tablets and computers. It is interesting to see this latest research support prior findings that our children can tend to prefer reading eBooks to print which I keep finding a fascinating result. Obviously, it’s still very subjective with each child having their personal reading preferences (just as we adults do) but it’s an important factor to consider as parents and teachers being the ones providing access to print vs digital reading materials for our children. I look forward to seeing more research and reports that explore children’s reading and early literacy habits. I hope researchers like Merga and Roni continue to delve into these studies because their findings can play a powerful role in helping us understand how to motivate and engage our children in reading now and into the future.